When my oldest child was very young, a friend of mine told me that they were looking into homeschooling. After she explained the concept to me I thought it sounded like a great idea. I had an OK experience with public school, but was very shy and didn't really thrive in the public school environment. I meet lots of kids that wish their parents would homeschool them. I think I would have really enjoyed homeschooling. I'm glad I can provide this experience for my children. Sure they mention going to public school once in a while, but they enjoy learning at their own pace in their own time. We live in a small town and enjoy the small town atmosphere. We enjoy visiting the big city though. We just wouldn't want to live there. We enjoy gardening and swimming in our pool in the summer. In the winter, my husband is a wrestling coach, so we follow and support his team as much as we can. When people ask me what I use for homeschooling, I just tell them I use what I want to use for each individual child. There are so many great resources out there that I don't like to be confined to one curriculum. That's the beauty of homeschooling, after all, and what makes our home school story our own. This website is dedicated to helping other homeschoolers enjoy homeschooling to the fullest. For those starting out I want to help guide them through the maze of choices. And for the homeschooler that is a little (or a lot) burned out, I want to give them some fresh ideas and content to be able to continue homeschooling and enjoy it! 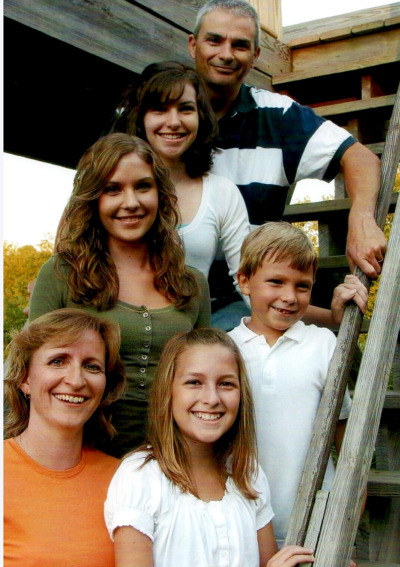 I have written several ebooks about homeschooling, cooking, organizing, and weight loss. 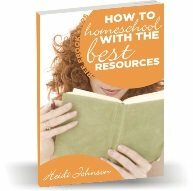 Free homeschool ebooks are called "How to Homeschool Using the Best Resources" and "How to Get Started with Homeschooling". "Internet Resources for Homeschooling" which is a book that I wrote that has over 300 websites in it that I reviewed personally and are listed as resources to enhance any homeschool plan for Kindergarten through College. "How to Homeschool Kindergarten" This book gives you a simple natural approach that you can use to homeschool your young child in a low stress/high results environment. "Smart Way Cooking" - I have been doing freezer cooking for many years but I have come up with a system that is much better and easier than Once a Month Cooking and can produce even more meals. "Cooking From Your Cupboard" - This past year I came up with the idea of compiling a cookbook with all our favorite meals that anyone could make from the list of ingredients that I give them in the book. It's color coded by ingredients (frozen items, stock up items, and fresh items). If you keep most of the items in stock, you'll be able to make the 30 meals I give you! I had fun writing the book and still use the book almost every day. Getting it All Done and Other Myths Women Believe - This is my newest book where I share all my best organizing and time management tips. If you're tired of not getting everything done or being disorganized, then this little book is for you! 101 Activities Parents Can Do With Their Preschool Child - Get this book at Preschool Ideas. Our home school story started with preschool and this is what we used. Whenever you purchase books recommended on this site, purchase books that I have written, or click on link you see listed on this site, you help contribute to our family and help me be able to continue to provide good content for other homeschool families. I also offer phone help if you want a real person to talk to for an hour. You can get more information about this service at homeschool coach. God has blessed us 4 wonders that God has entrusted to us for a time and I intend to provide the best environment I can give them to help them grow into well-adjusted, responsible adults. As you read through these pages and my blog, you'll be able to keep posted on the rest of our home school story.